Just in time for Memorial Day, ground was broken on the site of a new project to house homeless veterans in Northeast Los Angeles. The Marmion Way Apartments, located adjacent to the Heritage Square Gold Line Station in Cypress Park, will house 24 homeless veterans with special needs and 24 low-income families, with preference being given to the families of veterans. “This is a very concrete way to bring our veterans home,” said Councilman Gil Cedillo (CD-1) last Friday morning during the groundbreaking ceremony for the project being built in his district. The recent homeless count conducted by the Los Angeles Homeless Services Authority found 2,991 homeless veterans, including 218 female veterans, living on the streets of Los Angeles. Of those, 203, including three of the female vets, live in the first district, which encompasses part of Northeast Los Angeles, Chinatown, University Park and MacArthur Park. 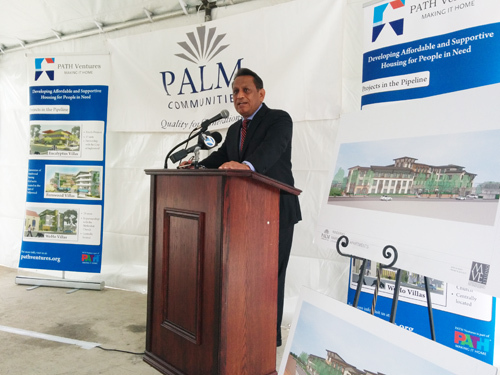 Also at Friday’s ceremony were the various partners working to bring the housing project to fruition: Affording housing developer Palm Communities; social service provider PATH Ventures; the Veterans Administration (VA) and the Los Angeles Housing Department. Once built, the Marmion Way housing project, with subterranean parking, will include social service programs to support residents gain financial stability and to maintain their health. PATH Ventures, which will oversee the social service element, will offer a variety of literacy and skill building programs, such as computer training, adult education, money management. They will also provide nutrition and wellness programs, after-school programs, individual counseling and case management. Veterans will have access to job training, veteran-specific legal assistance and healthcare services provide by the VA.
“When we build this, we will see less encampments. When we fill up the units, we will see less homeless,” said Cedillo, referring to growing number of homeless encampments in the city. “This is the solution,” Cedillo told the crowd of about at the event. PATH Ventures Executive Director Amy Anderson told EGP they will use government subsidies to pay for the services being offered. “Homeless veterans as a priority,” she said. It was a sentiment echoed by Cedillo who said he has a bias for the men and women who place their lives on the line “to protect our quality of life.” They deserve “the very best that we have to offer for all their service and their commitment” from our government and the private sector, the councilman said. The Marmion Way Apartments will be located at 3500 Marmion Way and are expected to open in October 2016. A larger housing project planned for the first district in Highland Park is awaiting a judge’s approval, according to Cedillo. If approved, the 60-unit development will include housing for low-income families and veterans. The controversial Highland Park Transit Village project, which would be built on two large public lots adjacent to the Gold Line stations in Highland Park, has been in the works for years. Residents and local businesses have complained the projects are too dense for the area, and will add to local traffic congestion and reduce parking in the area. “A group of local residents challenged the adequacy of the city’s environmental review and at this point, a final ruling by the judge is pending,” explained Cedillo’s Senior Planning Deputy Gerald G. Gubatan. The city favors building housing adjacent to transportation corridors, including rail lines. May 21, 2015 Copyright © 2012 Eastern Group Publications, Inc.